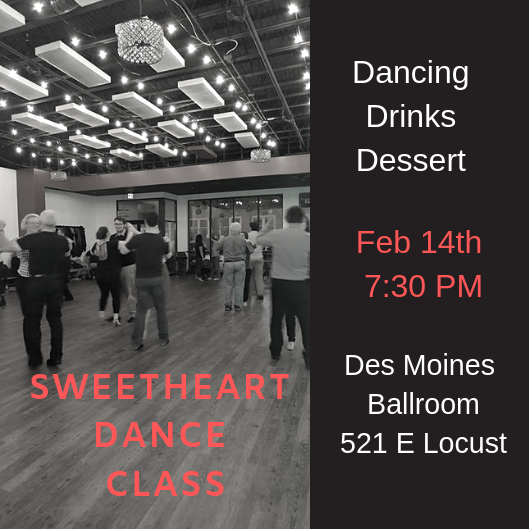 Join us at Des Moines Ballroom dance studio for a unique valentine's day experience. Learn a few dance steps or at least get more comfortable together on the dance floor. Drinks and desserts will be provided, along with a beginner-level dance lesson. We hope to send you home with something to practice! Details: Dress is comfortable/casual. Complimentary parking available in the ramp on E 6th & Locust. Please arrive at 7:30 p.m. The class length is 1 hr.